will i have any problem on next visit in feb 2019.
any info or thoughts please. I think you should not have a problem because you have no bad stamp in your passport. They are looking for longtime overstayers. But better stay clean and not overstay on your next trips. And once they stamp you in make sure to check immediately that they've given you the 30 day one. Sometimes they make a mistake and grab the wrong stamp. 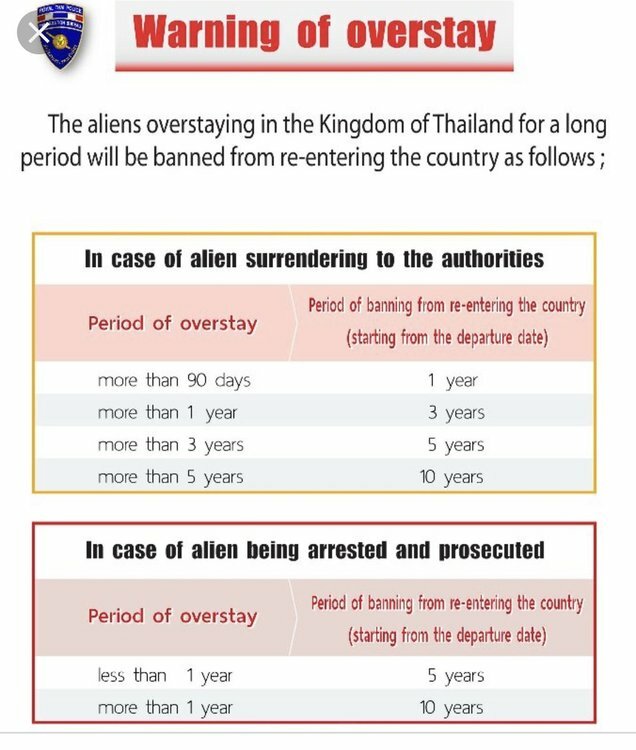 Amuses me how Thai immigration referred to overstayers as Aliens. In my experience I have departed at around 33-36 days on many occasions and never an issue, no fine, fee or stamp. However if I stay beyond 30 days, which I regularly do, I now prefer to be cautious and get an extension at immigration in Jomtien. Another 30 days for around 1800 Baht - Baht well spent for piece of mind. no , no problem. The most serious issue would be being caught by (immigration) police during a routine control for example whilst overstaying. That normally means jail and organizing your "bai' out from there... That is why overstaying is always a bad idea. You will be fine (no pun intended!) as you do not have an overstay stamp in the passport. Immigration and overstaying is a big issue with Big Joke at the moment so in the current clime I would suggest you did not overstay on your next visit. That was before. Now they charge also on the first day. thanks guys for putting my mind at ease, it was a simple mistake how i overstayed by 1 day, like i said , no red or bad stamp in passport and was not fined. reason i wanted to know is because i use fasttrack to clear immigration and on their form , they say can not do for persons who have overstayed. I exit thru "fasttrack" but this time i needed a re-entry permit. I was told to go thru to the concourse and turn left and walk about 100 yards to the slowtrac area and turn left again. this takes you back up behind the immigration desks where the overstay desk is located and also the desk for re-entry permit. Single permit is 1000 baht plus 200 form filling and photo fee....3 people ahead of me ...15 minutes. It's happened to me a couple times, I had assumed incorrectly that the 30 day clock started ticking when you had your passport stamped when entering but it starts at 00:01 on the day you enter. If you have a late arriving flight, say 11:15pm, you will probably be on your second day by the time you leave the airport.